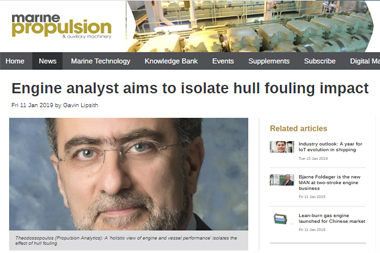 Panos Theodossopoulos, discusses with Gavin Lipsith, editor at Marine Propulsion, about a ‘holistic view of engine and vessel performance’ that isolates the effect of hull fouling and will help operators to more accurately plan when to clean their vessels’ hulls. Propulsion Analytics has already conducted one pilot project for the solution, which draws on engine data processed by the company’s Engine Hyper Cube software suite. A digital twin of the engine enables the system to isolate changes in performance attributable to the vessel’s operating conditions (including weather, sea state and loading).